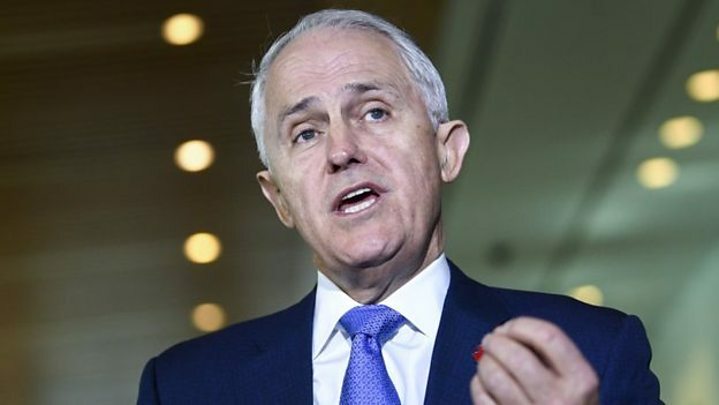 Pressure is mounting on Australian PM Malcolm Turnbull as internal party rivals prepare for a potential imminent leadership contest.Mr Turnbull is fighting to retain his position amid a push by senior colleagues to replace him as leader.He says he will stand down if a majority of Liberal Party MPs sign a letter to bring on an internal vote. If that happens, a ballot for a new leader will take place on Friday in what is likely to be a three-way race.The prime minister is facing pressure following poor opinion polls, losses in recent by-elections, and a revolt by the conservative wing of his party. Internal rumblings came to a head in a debate about energy and climate change policy - polarising issues for his centre-right coalition. Former Home Affairs Minister Peter Dutton, Foreign Minister Julie Bishop and Treasurer Scott Morrison are seen as leading contenders in the event of a ballot.On Thursday, Mr Turnbull stared down calls for his resignation as the crisis continued to cripple his government.Mr Turnbull told reporters that Australians would be "rightly appalled by what they are witnessing".He set a deadline of 12:00 local time (02:00 GMT) for his rivals to produce a letter with at least 43 signatures. Mr Turnbull said he would not run if a contest took place. Mr Dutton launched an unsuccessful leadership challenge on Tuesday, losing by a slim margin of 13 votes.The past decade has been marked by a series of leadership coups, with three sitting prime ministers deposed by party rivals.Not a single leader in recent times has succeeded in serving a full three-year term as prime minister.